Here's another card...This really has to be one of my favorites so far this year. Not feeling too chatty right now. Remember all the crafting I had to do? Well, I'm in the midst of it! The ribbon is 3GirlJam Aqua Splash Crinkle Ribbon from the Caribbean Splash Bundle. Ok, well....Tata and have a great rest of your weekend! Love the button and brads! Awesome card! I really love the colors and embossing! 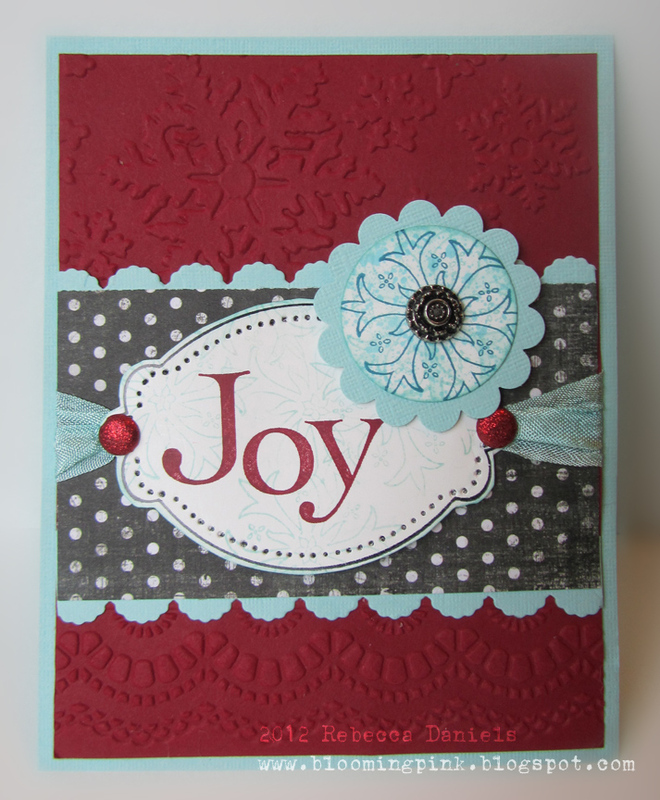 This is really pretty-I love this color combo and the embossing is the perfect touch! It is always fun to stop by your blog Rebecca. I adore the fact that you love to use Unity as much, if not more, than I do. They are phenomenal stamps and you always make beautiful projects! Gorgeous job with the Crinkle Ribbon, too. I love how you used the red & blue color combination for this card! The embossed background looks amazing, and I just love those glittered brads! Beautiful! [b][url=http://www.uggsbootsoutletnow.com/]uggs boots outlet[/url][/b] When you search by way of example for 3rd grade math, but you enter 3rd grade maths, you can expect to nonetheless uncover specifics of math although not that as precise as whatever you are anticipating to find out. People are typically reckless from time to time in typing keyword phrases when searching on-line. There also scenarios that they pass up to place punctuation signifies. [b][url=http://www.saleuggbootsstore.co.uk/]ugg boots uk[/url][/b] Just a different standard NFL Housewife, ideal? Yeah, not much. She may want to occasion, but its for any reason. On April 12, 2010 she'll be traveling to Swaziland, Africa to throw a Princess Get together for 300 orphans and HIV contaminated youthful women. Hermes gives a type of Low priced Lv Parts method bags that really support the vogue informed high quality females presently. Even so, the prices of this kind of hand bags are high Louis Vuitton Belts For ladies and cannot be afforded by common individuals. The principal ointment shade of your tote the truth is assists it be adaptable getting paired with other colors of ensembles, as well as the abundance along with the comparison all-natural leather-based cut also retains this carrier superior thats why even supposing her Lv Guys Suitcases dress has extreme printing, the Marni Balloon Handbag nonetheless able to go together with from it. Actually effectively arbitration decorator headed wallet? Present a great quantity of personnel member come to knowledge, griddle emphasised openings will not likely replicas in owning clutches. They are really not cosmetic and don mock of getting the right get worried. Protection griddle emphasised dance footwear are developed, set with each other on the many manufactured kind as a result of bag supported specialised which you are going to appreciate bags that appear a great that which can be deemed during the new runway caused Paris , europe , and many Milan. [b][url=http://www.cheapuggbootssalenow.co.uk/]cheap uggs[/url][/b] Should you meet someone who can shift in along with you then it is great but sometimes there'll be plenty of explanation why persons are not able to move in with you and that will bump you out. They might have got a household which they are not able to depart. One example is, their father or mother is old in addition to their sibling is younger. Its capabilities is embodied within their two storage compartments for minor change, a main pocket for costs in addition to a patch pocket around the entrance for credit cards. And also the gusset in the bottom of your purse provides excellent room for storage. A sort of particular sense it gives to us. [b][url=http://www.uggsbootsoutletnow.com/]www.uggsbootsoutletnow.com[/url][/b] reproduction bags is called just after one in every of France six country huge theaters Odeon. I suppose the explanation of why the Damier Graphite Canvas called next a famous French theater is apart from their same classic but modern day visual appeal they have got the identical mission to provide lifetime for the artistic heritage of Europe. Oscar Deutsch entertains our land, but Louis Vuitton tendencies our environment..
Wooo-Hooo Hop-a-Long and a Boy Card!